Happy Monday, all! If any of you are in the path of this "Frankenstorm" that is hitting the Eastern Seaboard, please know you are in our thoughts and prayers. My in-laws are right there, so we've got our eyes on the weather map, all the way in AZ. Hopefully this post will make it worth your while, for all of you-it is a Monday after all. We are in the final week of the month, which means our final week of our month long blogiversary celebrations! We've had such great support from some fabulous sponsors, giving away some beautiful wedding related giveaways to some of our lucky readers! The fun isn't over yet, we have a few more sponsors to introduce you to! This week we are happy to present you all to a beautiful Etsy shop called Change of hART, specializing in distinctive jewelry and custom alternative wedding flowers. Their wares are perfect for weddings, both in custom jewelry & wedding florals, such corsages and boutonnieres. At Change of hART they work with their bridal clients to make their accessories unique and one of a kind for their wedding day-no two are alike. Take a look at a few of our favorite picks from their extensive collections-it's really hard to pick a favorite! The Vintage Peacock Bridal Bouquet is so stunning. Honestly, if I had seen this bouquet, not only would I have chosen it to be my bouquet, but the design and color palette would have had much influence on my wedding's theme. And...what I would give to have had these beautiful corsages for my mother and mother-in-law. These are gorgeous! 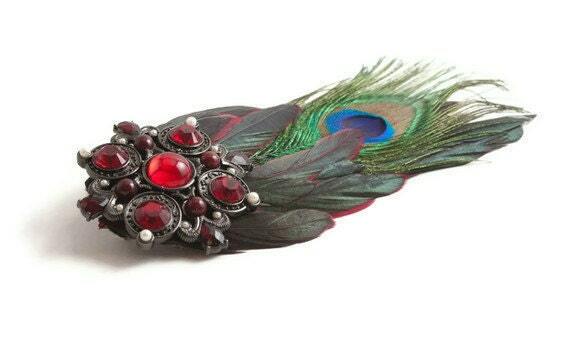 I love the incorporation of the feathers, brooch, and beautiful fabric flowers. We have some good news for you all! 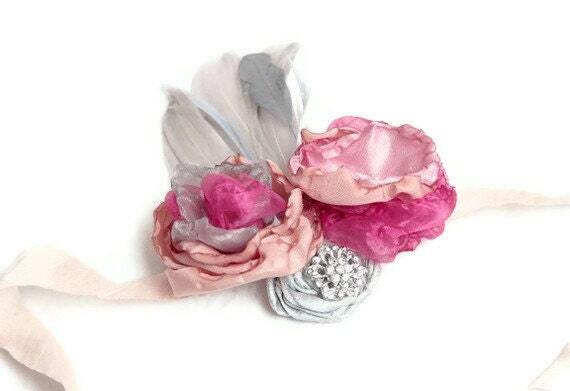 Change of hART is giving away to one lucky Savvy Deets Bridal reader one of their beautiful corsages, in the winner's choice of colors and will be custom made! What a fabulous giveaway! Be sure to enter the contest in the widget below, and GOOD LUCK!! A big thank you to Change of hART for being this week's featured sponsor, and for this wonderful giveaway! 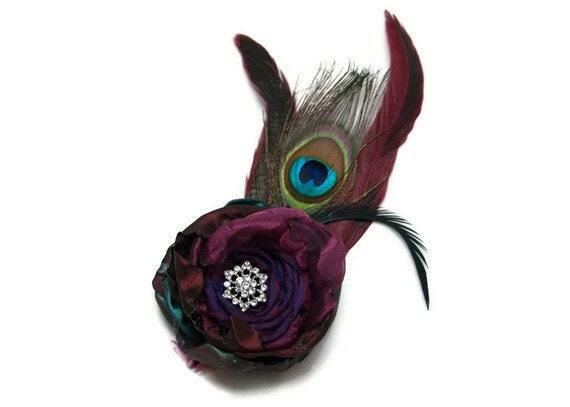 My favorite is the "Elegant Custom Boutonniere in Your Wedding Colors". I'd love a light pink and light blue. 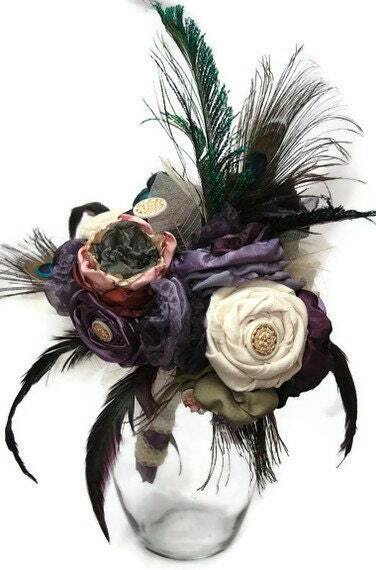 I adore the deep, rich palettes like the Peacock Boutonniere and Bouquet, so dramatic, femme fatal like!! I like the Vintage style wrist corsage. I like deep jewel tone colors, I'd leave it up to you for specifics. Peacock Boutonniere is my favorite and I love its colors. Hope can be lucky.Thanks for giveaway . The pink and cream colors are gorgeous!